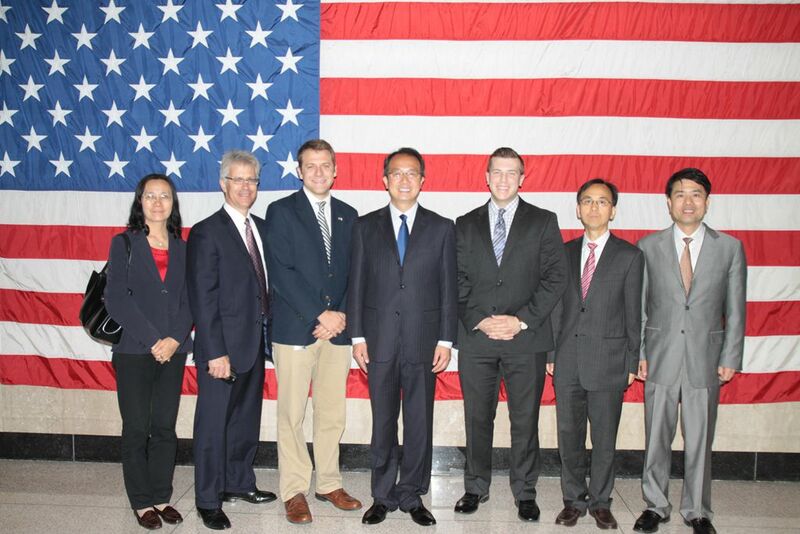 On September 21, Consul General Hong Lei met with U.S. Senator Chuck Grassley's District Director Alec Kennedy and U.S. Senator Joni Ernst's District Director Matthew Sexton in Des Moines, the State Capital of Iowa. Consul General Hong Lei introduced China-Iowa cooperation and exchanges in economy, trade, culture and education and the development of China-US relations. He said that China-US relationship is one of the world's most important bilateral relations and the two countries have common interests in extensive areas. Sub-national exchanges like those between China and Iowa are growing rapidly and bringing the two peoples closer. The Consulate General would like to work together with the two senators and the district offices to push forward friendly cooperation between China and Iowa and China-US relations. Director Kennedy said that Senator Grassley closely follows US-China relations and believes cooperation between the two countries is very important. Director Sexton said that he is happy to see Iowa's cooperation with China has achieved concrete results. The District Office will maintain close communication with the Consulate General so as to strengthen Iowa-China exchanges.